Newry City AFC Manager Darren Mullen admitted that his side have played better on the road this season and not taken anything from games after City picked up their first points away from home with a well-earned victory over Coleraine on Friday night. City had lost all eight of their previous matches away from their own venue in their first season in the top flight, but they ground out the win against a lacklustre Bannsiders in front of the BBC cameras. There was another first for the club this season, with Mark McCabe, Newry’s top scorer in their Championship promotion campaign last time out, but who had yet to find the net in the Premiership, struck the only goal of the game with as superb lobbed volley nine minutes before half-time. “I watched Coleraine against Warrenpoint last week and we knew there would be space in behind. With Mark’s pace, he was always going to be threat. He just needed something to go in and it was a terrific way to get off the mark for him. “I thought we were worthy winners, though I’m a bit disappointed we didn’t finish it off and make it even easier for ourselves. We had opportunities, but I’m just happy to get the points at this stage,” said the City boss. “It’s very difficult to get points anywhere in this league, home or away, but we’ve been playing well without getting the results. Tonight was more of a gritty performance and we’ve probably played better [in other matches]. But we defended better tonight and it was a long second half. 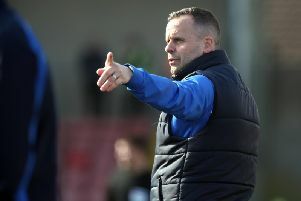 There were some boos at the final whistle from the home support following successive defeats to the Premiership’s two South Down clubs and Bannsiders manager Rodney McAree said everyone needs to reassess things between now and the opening of the transfer window on January 1. “It’s hugely disappointing. We huffed and puffed for long spells in the game, but ultimately we haven’t done enough. We haven’t shown enough determination to go and get anything out of the match. The team that showed the greater fight and the greater hunger won the game of football and that’s disappointing,” he said. “It’s disappointing for me. I’ll accept the responsibility. At the end of the day, I’m big enough to stand up and hold my hands up and say that it wasn’t good enough. Others have to do the same, they have to go away and look at their own game and they have to work out whether they want to play for Coleraine for the foreseeable future. Whether they don’t want to play for Coleraine or they don’t want to play for the personnel here, I don’t know. But I think everyone needs to have a bit of a reality check. “We’re not doing enough in the final third. Things aren’t falling for us either. There are blocks in the box, headers and we’re not picking those things up, the opposition are. “It’s frustrating, but we have what we have to work with what we have at the moment. We have to work with them and get more out of them. “We’ve still a month to go before January, but listen, players are playing for their future. They have to look after themselves and they have to show the desire that they want to be at this football club,” McAree added.